Q: If I use the Search Engine Friendly Code feature, do I have to update or redo it each time I change the drop menu script and save, or if I do it once to the file will it automatically update on every save? 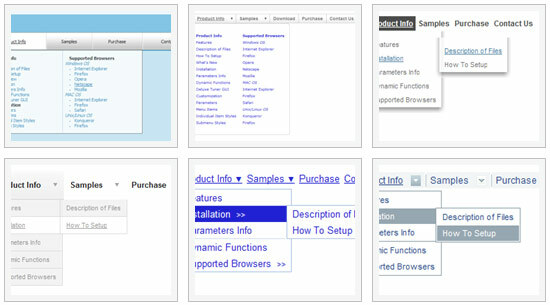 A: If you change drop menu script items (item's text and links) you should updateyour search engine friendly code. Deluxe Tuner doesn't update it onevery save (when you save your data file). 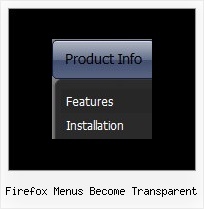 There is no need to update it when you change menu parameters only. Q: Why is it that when we place a drop menu ina div that the droppping part is not right uner the menu? The menu on top banner is the problem.. Thesame code outside of a div futher down the page works fine. I can place the same menu outside of the div and it works fine.When it is in a div the drop part of the menu is pushed to the far right of the screen. A: Brian, see, the problem is that the script can't get css properties of the object if they are described in separate .css block (or file). In other words, you can't get the value of "POSITION: absolute" attribute of the object if the object doesn't have this property within inline style (style="POSITION:absolute;"). To get the value you should move .css style into style="" attribute. Q: Ich benutze Deluxe Menu 2.0! Beim InternetExplorer funktioniert das PullDown Menue nicht, bei Firefox und Opera gibt es keine Probleme. litebox and flash seem to be culprit for firefox on Mac ... have you used the code transparant inside the object of flash? To get behind menu? .... New issue for me (with Nexus), but this seems to be a recurring theme on some of the other ... Menu hides behind a wrapped PDF. Does this use flash to display the PDF?